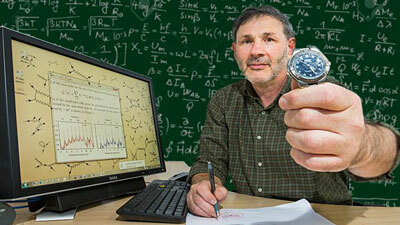 (Nanowerk News) An international team of scientists studying ultrafast physics have solved a mystery of quantum mechanics, and found that quantum tunneling is an instantaneous process (Nature Physics, "Interpreting attoclock measurements of tunnelling times"). The new theory could lead to faster and smaller electronic components, for which quantum tunneling is a significant factor. It will also lead to a better understanding of diverse areas such as electron microscopy, nuclear fusion and DNA mutations. "Timescales this short have never been explored before. It's an entirely new world," said one of the international team, Professor Anatoli Kheifets, from The Australian National University (ANU). "We have modelled the most delicate processes of nature very accurately." At very small scales quantum physics shows that particles such as electrons have wave-like properties - their exact position is not well defined. This means they can occasionally sneak through apparently impenetrable barriers, a phenomenon called quantum tunneling.